Our customers place a great deal of trust in us to maintain their buildings and properties. Their referrals are the highest compliment we can receive, and we consider their testimonials the true measure of a job well done. Please read on to see what satisfied customers are saying about Nap’s Maintenance! We’re also interested in what you have to say. I have hired Naps before for the Westcott Family, and they never disappoint, but I would like to give a shout out to a particularly awesome gentlemen who works for Naps by the name of Mark Priest, he is soooooo gracious, kind, professional!!!!! He goes above and beyond and I appreciate him. He truly seems to love what he does and has been with the company for over thirty years.. Thank you very much Mr. Priest! I manage 6 properties and finding professional cleaning services has always been difficult. Until I met the team from Naps. Tim visited my disaster of a jobsite, made good suggestions I would not have considered. His team was outstanding and the work was amazing. Naps sent me their workman’s comp policy immediately for my records, were on time, completed the job on-budget, and followed up to make sure I was happy. By my estimation, Naps SAVED me $2500 I had planned to spend on paint and new carpets by restoring the soiled ones to like-new condition. We have been using Nap’s Maintenance cleaning services for two years here at our new office and we couldn’t be more pleased with their service. Their attention to detail is excellent. In addition to our normal cleaning services they clean our windows in and out on a quarterly basis. Their ability to customize the service with regard to which nights or weekends depending on what is going on in the office makes it easy for us. The flexibility and competitive pricing were key decision points. I highly recommend using Nap’s Maintenance cleaning services for all your cleaning needs. I have used them for both personal and business. My boss also uses Nap’s Maintenance . The owner, Tim Henry, and his staff are very professional, courteous and easy to work with. My company has been using their services for at least 25 years–that tells you they are a great company. If you have any complaints or comments, they are taken care of right away. I give them a five star rating. Nap’s is very dependable, courteous, and professional. We at Pitas Construction Company use Nap’s Maintenance for all our rug cleaning needs in our townhouse/condo units. Nap’s always books the appointments in a timely manner and the prices at Nap’s are fair. The rugs are always cleaned to perfection and the staff is friendly and professional. We continue to enjoy working with them and plan to use them in the future. 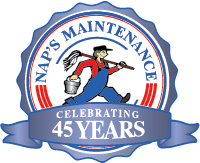 I have had the pleasure of using Nap’s Maintenance for many years. They did an outstanding job cleaning my kitchen cabinets and floor –my cabinets looked brand new when they were done and my floor looks as though it had just been installed. I highly recommend them as one of the best!!! The owner is always pleasant and helpful with suggestions and the secretary always friendly and helpful. We have used Nap’s for all our heavy duty cleaning for over twenty-five years. They are very prompt, courteous and do an excellent job! Our carpets and upholstery always look beautiful and our bathroom stains totally disappear! I also use them at the Original Congregational Church in Wrentham for carpet cleaning and removing stubborn stains in the restrooms. We don’t know what we would do without them.